Skype version 7 or later is not supported currently. GV-VMS supports connection with up to connection with up to 64 IP devices. You can connect up to 32 channels of GV-IP Devices for free. If you need to connect more than 32 channels of GV-IP Devices or connect with third-party IP devices, license is required. •	GV-VMS Pro license, 32 ch per license. •	3rd-Party license, in increments of 1 ch. 1. GV-USB Dongle comes in internal and external dongles. It is recommended to use the internal GV-USB Dongle to have the Hardware Watchdog function, which restarts the PC when Windows crashes or freezes. 2. GeoVision offers a 60-day trial period that allows you to connect to 16 channels of third-party IP devices without license. Currently, you cannot remotely access the trial channels using remote applications. 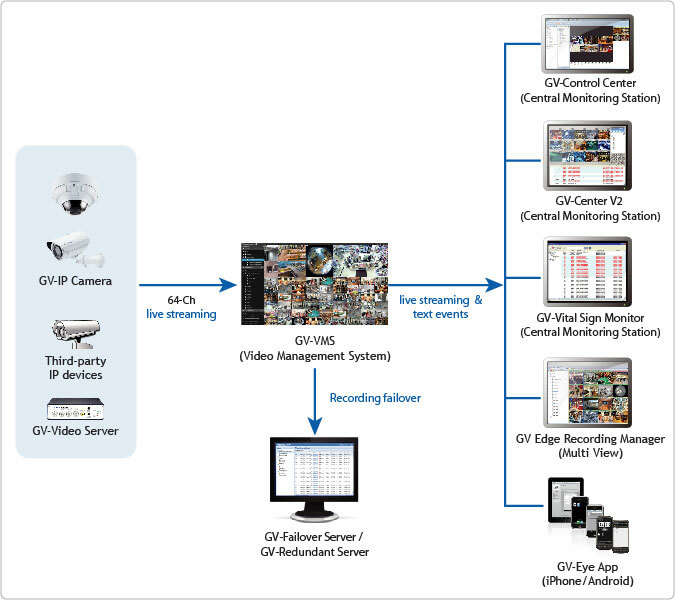 Below are the recommended PC requirements for connecting GV-VMS with 32 and 64 channels of GV and 3rd party IP cameras (dual streams). Please see the GPU Decoding Specifications below. Note: To use the fisheye dewarping function, the graphic card must support DirectX 10.1 or above. The data transmitting capacity of GV-VMS depends on the number of Gigabit connections available. The numbers of Gigabit network cards required to connect 64 channels are listed below according to the resolution and codec of the source video. Note: The network requirements may vary depending on the bit rate of the streams. Since the size of transmitted data from IP cameras may be quite large and reach beyond the transfer rate of a hard disk, you should note the total recording frame rates that you can assign to a single hard disk, as listed below. Note: The data above was determined using the bit rate listed above and hard disks with average R/W speed above 110 MB/s. The frame rate limit is based on the resolution of video sources. The higher video resolutions, the lower frame rates you can assign to a single hard disk. In other words, the higher frame rates you wish to record, the more hard disks you need to install. For the information of recording frame rates, you may consult the user’s manual of the IP camera that you wish to connect to. A higher total frame rate can be achieved if your CPU or external VGA supports GPU decoding. External VGA: GPU decoding is only supported when using NVIDIA graphics cards with compute capability 3.0 or above and memory 2 GB or above. To look up the commute capability of the NVIDIA graphics cards, refer to: https://developer.nvidia.com/cuda-gpus. Note: NVIDIA graphic cards do not support H.265 GPU decoding. On-board VGA + external VGA: To have both the on-board VGA and external VGA perform GPU decoding, the VGAs must follow their respective specifications listed above. 1. If you have both on-board VGA and external VGA installed, the on-board VGA must be connected to a monitor for H.264 / H.265 GPU decoding. 2. You can install multiple external graphics cards if needed. 3. CUDA compute capability 5.0 or higher is required to ensure optimal performance. 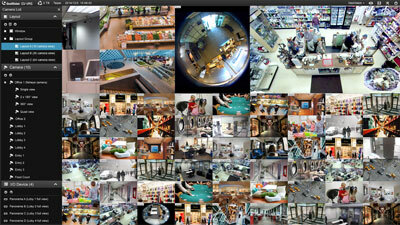 For more information, see「Total frame rate and number of channels supported」. Refer to the documents below to see the total frame rate and number of channels supported by GV-VMS when connected to different IP devices.